The inhibition of the enzyme SARM1 is emerging as a potential strategy to protect the axons of neurons from being destroyed due to injury or chronic neurodegenerative disease (see February 2015, March 2017 news). But according to a new study led by Oregon Health and Science University’s Marc Freeman and University of Massachusetts Medical Center’s Robert Brown, this strategy may not reduce axon loss in ALS. The study found that SOD1 G93A ALS model mice that are unable to produce this enzyme did not live longer. And, no improvement in motor function including muscle strength could be detected. Together, the findings open up the possibility that axons degenerate in ALS and acute neuronal injury by distinct mechanisms. The findings appeared on July 14 in Human Molecular Genetics. 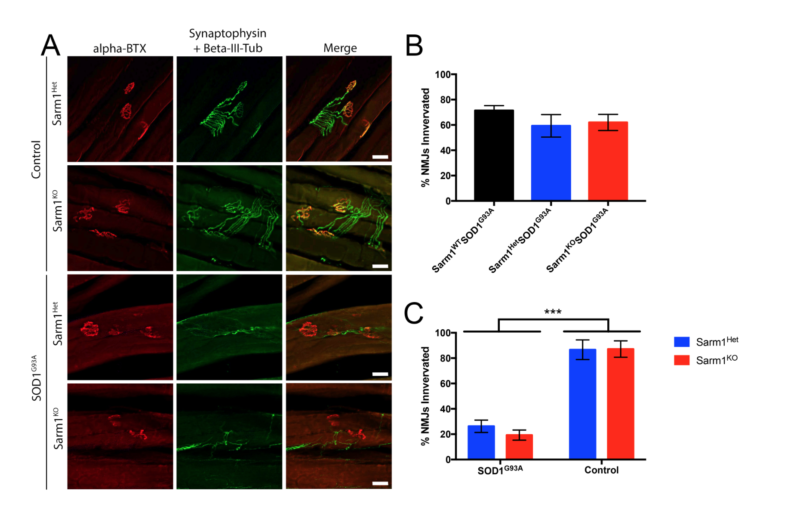 SARM1 is an NAD+ase that triggers the destruction of injured axons by depriving them of energy by locally depleting ATP (see April 2015, March 2017 news; Gerdts et al., 2015; Yang et al., 2015; Essuman et al., 2017). SARM1 inhibitors are being developed by Disarm Therapeutics in Cambridge, Massachusetts as a potential therapeutic option for a wide range of neurological conditions including traumatic brain injury and peripheral neuropathies (see Henninger et al., 2016; Geisler et al., 2016). 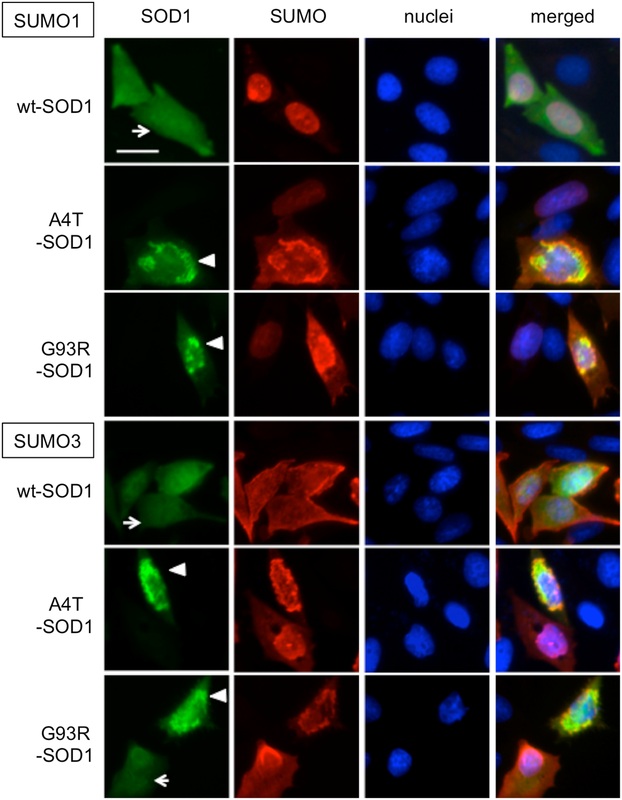 Peters OM, Lewis EA, Osterloh JM, Weiss A, Salameh JS, Metterville J, Brown RH, Freeman MR. Loss of Sarm1 does not suppress motor neuron degeneration in the SOD1G93A mouse model of amyotrophic lateral sclerosis. Hum Mol Genet. 2018 Jul 14. [PubMed]. Essuman K, Summers DW, Sasaki Y, Mao X, Yim AKY, DiAntonio A, Milbrandt J. TIR Domain Proteins Are an Ancient Family of NAD+-Consuming Enzymes. Curr Biol. 2018 Feb 5;28(3):421-430.e4. [PubMed]. Geisler S, Doan RA, Strickland A, Huang X, Milbrandt J, DiAntonio A. Prevention of vincristine-induced peripheral neuropathy by genetic deletion of SARM1 in mice. Brain. 2016 Dec;139(Pt 12):3092-3108. [PubMed]. Henninger N, Bouley J, Sikoglu EM, An J, Moore CM, King JA, Bowser R, Freeman MR, Brown RH Jr. Attenuated traumatic axonal injury and improved functional outcome after traumatic brain injury in mice lacking Sarm1. Brain. 2016 Apr;139(Pt 4):1094-105. [PubMed].